We are just less than few weeks to the year 2019 general election in which millions of Nigerians are expected to participate in electing sets of Nigerian office seekers to occupy for four years some strategic national and state wide offices. Nigeria is not only in a Christmas mood but also in a campaign season with thousands of desperate elective office seekers traversing the entire country or their respective states canvassing for votes. Political campaigns by the two major candidates for the much coveted office of the president of Nigeria have commenced particularly by the opposition presidential candidate of the Peoples Democratic Party (PDP) Alhaji Atiku Abubakar, who was for eight years the vice president of Nigeria under the presidency of Olusegun Obasanjo, who retired from the Nigerian Army as a four star General in the late 70’s. In other words, all the candidates gunning for elective offices have embarked on massive marketing of their manifestoes and the developmental blueprints which they hope to use as magic wands to curry favour from the electorate in the forthcoming election. However, the actual election is heavily threatened by so many troubling and unresolved matters which may undermine the integrity and sanctity of the electoral process and could mar the elections and consequently lead to chaos, anarchy and doom if the early warning signals we are getting are not sufficiently deflated and tackled by all the relevant institutions and persons. By the above scenario, I mean the near total lack of independence of the national electoral management institution pejoratively known in the constitution as the Independent National Electoral Commission (INEC). INEC has a hierarchy that lacks credibility and integrity going by the circumstances of their appointment by the incumbent president and even the biological nearness to president Buhari of one of the key national commissioners. The electoral commission is alleged to have registered millions of underage voters in Kano state and even when there are credible evidence seen from the last Kano state local council polls whereby kids as young as three years were seen voting, the officials of INEC in Abuja have turned the blind eyes. This goes to show that the electoral managers lack independence and reputation to hold or organize a credible election. The other major threat to the smooth conduct of the election are the armed security forces and police whose heads are heavily compromised by the presidency to do the bidding of the incumbent president. In the last Ekiti and Osun states elections, INEC allowed the police to allow the All Progressives Congress (APC) to openly buy up votes from the severely starving electorate who sold their consciences for peanuts. The Osun state election was worst because the police physically prevented the opposition PDP agents from accessing their polling units thereby letting the APC freely rig the process. Also, the individual candidates are huge threats to the peaceful conduct of the election going by the widespread notion that most of them have already trained and equipped their armed hoodlums and are only just waiting for the election to come up so they can disrupt the process. Another threat is related to the shoddy registration of voters in which INEC registered foreigners in readiness for the manipulation of the process. Even INEC made the admission that it has found out that hundreds of illegal aliens successfully got their names into the national voters register. However, as I write there is no credible proof that any of these illegal registrants have been arrested prosecuted and sanctioned. Another threat to the coming election are the dare devil insecurity across the land. As we write, the North East of Nigeria is facing resurgence of boko haram terror attacks with millions of Nigerians been chased into internal exile as refugees in the many decrepit internally displaced person’s camps which themselves have come under increasing violence from the armed Islamists. The Nigerian Army has also come under regular attacks. Aside all these factors, the most disturbing is the clear partiality of the security forces including the Economic and Financial Crime Commission who receive direct orders from the presidency to go after opponents of the president so as to make the election a walk over for the incumbent who is accused of poor performance. Two Harvard Professors Steven Levitsky and Daniel Ziblatt in their book “How Democracy Die” alluded to a similar scenario that is playing out in Nigeria now to reach a determination that democracy dies when the elected president becomes authoritarian. There is no doubt that the current government has gone after political opponents and civil society activists with the recent clamp down by police on some notable activists like Deji Adeyanju amongst many others. An important correlationship exists between what those two Havard Professors wrote in their book “How Democracy Die” and what Economic and Financial Crimes Commission (EFCC) is been used as the attack dog of the current president to target the financial resources of influential opposition leaders so as to cripple the largest national opposition to All Progressives Congress. Already EFCC has gone after the key governors of the PDP who refused to play game with the president such as that of Rivers and Akwa Ibom even as members of PDP with large baggage have jumped into APC to gain soft landing from EFCC. Determined to get a firsthand information about the troubles facing the 2019 poll, I detailed my research assistant Miss Grace Cliff Obilor who interviewed the deputy speaker of Abia state House of Assembly Dr. Ndukwe Cosmos. Ndukwe (Ph.D) spoke with amazing frankness. At the end of the extensive and cerebral interview session, this is what Miss Obilor wrote as her findings. She wrote that since the end of the military rule in 1999, this the likely to be the sixth quadrennial elections in Nigeria and for some time now there have been troubling threats to elections in Nigeria. During general elections there are possible threats which presents itself to citizens, threats like snatching ballot boxes, shooting at innocent people, buying votes and using military to intimidate the citizens and at the end of the day it will discourage the citizens from casting their votes. 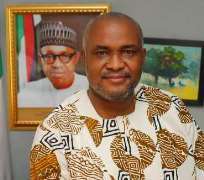 Now, in our interview with the Deputy Speaker Abia State House of Assembly Rt. Hon. Ndukwe Cosmos (PhD). He told us his impression about the forth coming general elections, He stated clearly that his intention is grilled with mixed feeling in the sense that the 2019 general election will be hazy and gloomy because the Electoral Act is not crystal clear, stating that he is a legislator and he understands the way bills are being read, from the first reading to the final pronouncement and at the end of the day, one man refused to sign it, thereby creating fear in the hearts of the citizens. Rt. Hon. Cosmos told us that for some months now ,the bill have not been signed and he don’t know what could be the fear of the presidency that he has refused to sign the bill and if the bill is not passed there means we are going with schizophrenic fear to the 2019 election, so majority of Nigerians are calling for a crystal clear election beyond signing the bill, they want their votes to count and once they have a feeling that their vote will count, they will come out and cast their votes. Rt. Hon. Cosmos talked about the possible threats to the peaceful conduct of the elections, He told us clearly that from the formal states that conducted their elections this 2018 that we can see that a new trend came in which is known as VOTE BUYING, and it is a very big threat, interferences like using the military during election is gradually creeping in to the electoral system. He went ahead to tell us it is an offence for security to carry guns around the units, and that is to say people who are supposed to protect us are now being used to fight us during the election. He told us firmly that if the military is not removed during the election, 2019 will not be peaceful, taking Osun and Ekiti as case study, the military is a serious threat. Talking about the state of preparedness of the candidates to accept a freely and transparently conducted election, the Deputy Speaker told us that the campaigns are not what they used to be like the during the past elections, the campaigns are not at its peak, when we have barely few months to the general elections and it looks as if nothing is happening , it doesn’t look as if the flag bearers are preparing for the elections maybe because of the threats and it that does not go down well, because they don’t actually want to stress themselves, mere looking at the nation, Political activities have not kicked off as usual, candidates are not struggling, maybe they are quiet preparing forms they will use to buy vote or something else. He went ahead to say that if the Electoral Act is being signed maybe the candidates will speak up and get prepared as usual, but for now he is not seeing that usual urge from the candidates. In his opinion regarding the independence of the Electoral Umpire, He stated clearly that the constitutional positions made it in a way that the INEC have to be independent but the state of the nation now is that sentiments have taken over virtually all the institutions that are supposed to be independence and right now most of the candidates from the 6 Geo-political zone suffer intimidation as a result of this. Speaking of the trigger points of violence as a consequence of a manipulated or rigged election, Rt. Hon Cosmos mentioned the polling units as the foundational point because this is where votes are initiated and that is why the New Electoral Act stated that the votes should be recorded and announced in the units immediately, that is to say that the late announcement of results often leads to manipulation and at the end of the day violence. The Deputy Speaker told us his impression about the poor turnover of the women candidates in the forth coming election, he told us firmly that Nigerian politics have not come of age democratically, where by husbands feel safe when their wives run along in politics, women are special and unique, moral pictures are adorned in our women and besides our political space is filled with violence, thuggery, rigging and so many others, if the institutions are sure that the peoples votes will count then women would like to come out. He went further to say that women may not like to involve themselves simply because our politics is full of secrecy, and also most people see the Nigerian politics as DIRTY and any woman that dares into it is seen as DIRTY too in other words women tend to stay on their own especially married women, they wouldn’t want to leave their homes to play politics which have been tagged DIRTY , so some women who play politics are wives of politicians or single women because here in Nigeria most women can’t do what it takes in politics. In conclusion, the Deputy Speaker Abia State House of Assembly said that they are preparing for the next general Elections, hoping that the Electoral Act will be Signed and also hoping for accurate vote counts and free and fair elections, so that the votes will be calculated freely and Nigerians will sit at home and know the results without fear. Having heard the opinions of the Deputy Speaker Abia State House of Assembly Rt. Hon. Ndukwe Cosmos (PhD), we will have to say that the troubling threats to polling are basically the vote buying exercise, result manipulation and the military interferences. The vote buying exercise took place in Ekiti State and Osun State and at the end of the day the citizens who came out with their PVCs went home angrily because their votes didn’t count, most of them faced embarrassment and humiliation from these armed military just because they came to cast their votes and this have in turn discouraged other citizens because most people have decided to stay at home on the day of the general election in other to be safe from these threats and this is not a good story to be told about this country, the appropriate institutions should make sure that all these threats which took place in the Ekiti, Osun election will not repeat itself in the general elections if not this possible threats will lead to violence which will in turn put innocent citizens at risk. The military and the security men should always be there to protect the interest and votes of the citizens not the other way round, if our country should continue to live in such manner, then we will be giving the neighboring countries a bad impression about us, equity and fairness should be our watch word. Finally the president should try as much as possible to sign the Electoral Act for transparency in the forth coming general elections, there should be no snatching of ballot boxes, no killing of innocent citizens, no manipulation of results and there should be no interferences by armed military.